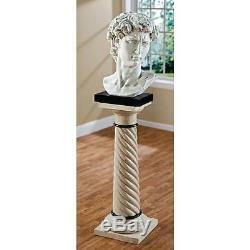 24 David Bust Head Statue by Michelangelo. Weight: 22 lb (10 kg). Dimensions: 15.5"W x 13"D x 24.5High (39 cm x 33 cm x 62 cm). One of the best replica statues of David we've ever seen! This two-foot high classic sculpture bust replicates one of the world's most recognizable works of art, and embodies an idealistic and naturalistic view of man. The 1504 High Renaissance masterpiece sculpture depicts the young shepherd whose faith in God allowed him to slay the giant Goliath. Upon completion of this classic statue Michelangelo proved to his contemporaries that he not only surpassed all Renaissance artists, but also the Greeks and Romans, by infusing formal beauty with powerful heroic courage and meaning. Cast in quality designer resin, this over two-foot-tall statue is gallery ready with a faux stone finish set atop an ebony museum mount. A wonderful balance of classic and contemporary accent decor piece! The item "24 David Bust Head Statue by Michelangelo" is in sale since Wednesday, January 30, 2019. This item is in the category "Art\Art Sculptures". The seller is "sculpture_collection" and is located in US. This item can be shipped to United States, Canada, United Kingdom, Denmark, Romania, Slovakia, Bulgaria, Czech republic, Finland, Hungary, Latvia, Lithuania, Malta, Estonia, Australia, Greece, Portugal, Cyprus, Slovenia, Japan, Sweden, South Korea, Indonesia, Taiwan, South africa, Thailand, Belgium, France, Hong Kong, Ireland, Netherlands, Poland, Spain, Italy, Germany, Austria, Bahamas, Israel, Mexico, New Zealand, Philippines, Singapore, Norway, Saudi arabia, Ukraine, United arab emirates, Qatar, Kuwait, Bahrain, Croatia, Malaysia, Chile, Colombia, Costa rica, Dominican republic, Panama, Trinidad and tobago, Guatemala, El salvador, Honduras, Jamaica, Antigua and barbuda, Aruba, Belize, Dominica, Grenada, Saint kitts and nevis, Saint lucia, Montserrat, Turks and caicos islands, Barbados, Bangladesh, Bermuda, Brunei darussalam, Bolivia, Ecuador, Egypt, French guiana, Guernsey, Gibraltar, Guadeloupe, Iceland, Jersey, Jordan, Cambodia, Cayman islands, Liechtenstein, Sri lanka, Luxembourg, Monaco, Macao, Martinique, Maldives, Nicaragua, Oman, Peru, Pakistan, Paraguay, Reunion, Viet nam, Uruguay.